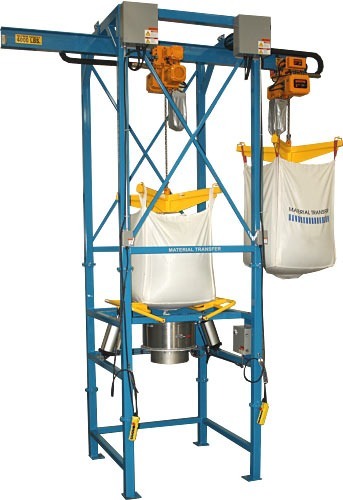 Includes two (2) Spider-Lift™ bulk bag lifting frames. Two (2) 2-ton electric chain hoists with motorized trolleys, monorail system, and pendant controls. Includes a 18” diameter stainless steel product discharge transition with 54” discharge clearance. Electrical system is designed for Class II, Div. II, Group G service location.